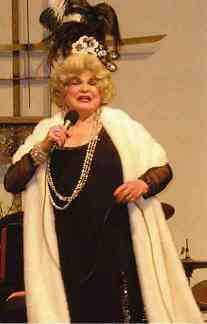 Pat portraying jazz singer Sophie Tucker in her performance of "Remembering Sophie Tucker, the Last of the Red Hot Mamas". 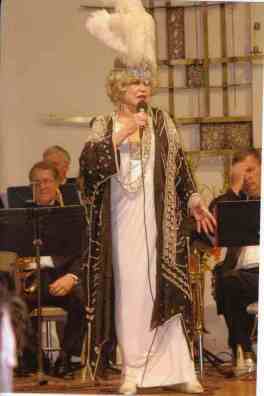 Pat looking glamorous in one of the fabulous costumes she wore during during the Sophie Tucker show. Pat said the headdresses were very heavy. Pat made us want to dance during some numbers, moved us to laughter in others and brought a few tears to our eyes during her rendition of "My Yiddishe Momme". Hear all the songs from the show by buying Pat's "Remembering Sophie Tucker" CD, available in the Music section. Not as good as seeing Pat in person, but the songs sound great!